Homeboy Industries, Urban Farming, Woolly Pocket and Farmlab collaborated to create a 24 foot "edible wall" at downtown L.A.'s Homegirl Cafe. Agromin donated all the soil for the garden that will grow fruit, vegetables and herbs. The fresh produce will be used in Homegirl Cafe dishes. The vertical garden will be grown in Woolly Pocket, modular gardening containers made sustainably from recycled plastic bottles. The edible wall project at Homeboy Industries is the fourth created in Los Angeles by Urban Farming. The gardens are intended for urban areas where ground space is scarce. Homeboy Industries assists at-risk and former gang-involved youth to become positive and contributing members of society through job placement, training and education. 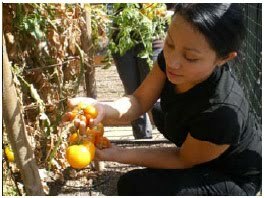 After a visit from Chef Alice Waters, Homegirl Cafe became fully organic, growing much of its own produce. Now, with the introduction of the edible wall, even more of what is served at the Cafe will come straight from the Cafe's own gardens.